Beautiful and elegant beach house in Indian Beach with spectacular ocean views. 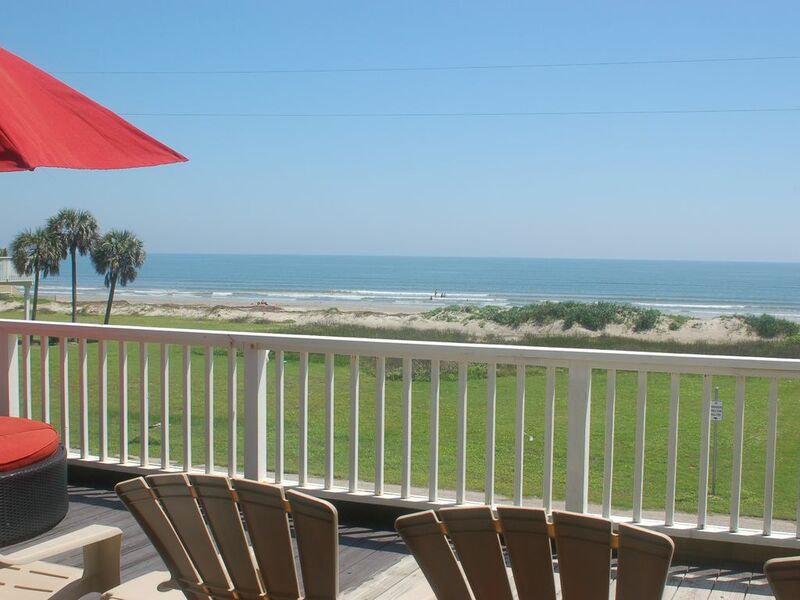 Spacious and elegantly decorated help make this property the perfect choice for your next beach vacation in Galveston. An open floor plan on the living area feels bright and airy and the large windows showcase the great Gulf views. The open living area has big-screen HDTV and plenty of comfortable seating. The dining table seats ten and there’s room for four more people at the island makes it easy and fun for everyone to enjoy meal time together. The kitchen has beautiful granite and stainless steel appliance! The kitchen easily accommodates more than one cook with plenty of counter space for prep work or serving space. In addition to the big screen TV in the living area, you'll find a television in the master bedroom and on the upper level. The master suite and two other bedrooms are located on the main living level and feature two beautiful large bathrooms. On the top level, you’ll find one large king bedroom and a bedroom with two pyramid bunks for the kids and it sleeps six. We rent only to family groups and responsible adults older than 25 years of ages; adult cannot rent properties on behalf of underage guests. Great property. We would rent this home again. Overall the property was great for the 5 of us and we would rent it again, however there are 2 things that we didn't discover until arrival. * The 5th BR is really a landing at the top of the stairs and there's no privacy. * The view is awesome, however this will only be true until a house is built across the street. We thought that the house was on the beach. My family and I loved our stay at this beach house! Highly recommended! Our Favorite Beach Vacation Yet! This home is beautiful, extremely roomy and just steps from the beach. The beds were extremely comfortable, and the kitchen was nicely supplied with necessities. It is, by far, our favorite of all the places we have stayed on the island. It is located in a quiet and well kept community. We enjoyed spending the day on the beach and sitting on the deck with it's beautiful view of the Gulf in the evenings. We are looking forward to our next stay. Thank you for sharing your home with us. The view was wonderful and unobstructed to the ocean. The location was wonderful and off the beaten path, so very quiet. The balcony was a wonderful place to sit, but needed more chairs for as large as this house was. The property was not very clean. There was dust on almost every surface, ceiling fans, vents, everywhere. The windows were not clean, smudges on inside and outside. There were dirty dishes in the dishwasher. The refrigerator shelves were nasty. There was a wash cloth on the showerhead of the upstairs bathroom and one on the floor there also. There was no washing powder to wash the towels, so we made do. We also ran out of toilet paper in two of the bathrooms. There were also several feather pillows on the beds, and for allergy sufferers it was miserable. There needed to be more kitchen towels, as there were none to dry dishes when we washed them. The upstairs A/C unit is controlled in one of the downstairs bedrooms and that was not made clear until we called the owner when it was still stifling hot upstairs. The owner was very nice and willing to call in a technician the next day, but we were able to finally make the A/C work. It just took a long time to cool down the house since the A/C was off when we arrived. Since we live in Texas, we understand about heat, but most places turn the A/C on before the guests arrive, not expect them to do it in the heat of the day on arrival. We booked this for a girls weekend trip and it was a good setup for that. With eight women, there were plenty of beds and sleeping surfaces for everyone. But be warned, sound carries well in the house since there is no carpet to dampen the noise. Everything said or done downstairs, could be heard upstairs. With only three bathrooms, it was a little hard to get everyone ready in a timely fashion, but we accomplished it. We had a great time using the coupons provided for go-karts racing! We also went to pleasure pier and had fun there. We enjoyed just walking on the beach and sitting on the balcony watching the ocean!! If you like mixed drinks, bring your own shaker as there was not one in the kitchen. Most other utensils were available though. The house was beautiful!!! Every room was clean and the beach house was spacious. Thank you for a great stay!!! We were pleased with the location of this rental. The house is just one lot set back from the beach...just a short walk across this lot and you are at the beach. Indian Beach here is very wide, pretty, open, very quiet with no vehicles on the beach. It is a pretty spot. From the deck you can see the water quite well - it is a good view. The driveway below the house provides a lot of space for parking and for kids to play, ride bikes, do games, etc. The rooms were well described in other reviews. However, we did not find the house as wonderful as other reviewers did - it was not as clean as we expect a rental house to be. The beds and linens were all nicely done. But the kitchen and bathrooms were not clean. We wiped down all the appliances and cabinets in the kitchen before we used them because there was food and handprints all over them. The oven had old food on the bottom. The master bathroom drawers had items left in them from the previous renters and hair. The tubs were not scrubbed clean. All the windows were dirty – not from ocean wind & sand – they were dirty on the inside and the outside… we cleaned those also. What was difficult to escape was the inches of dust on ceiling fans, baseboards, shutters that made us feel like the house had not been used in a long time. There are not many dressers (none in the master bedroom) and when our guests placed their clothes on the shelves in the closets the clothes were then dusty – from the layer of dust on the shelves! This is a fine rental house - well situated and ample space. But for this amount of money, it should be clean. I would be sure to confirm with the owner your expectations for cleaning prior to your visit. We would not return to this house – we’d rather rent from the local property mgmt. company that inspects its rental houses to make sure they meet standards.